A high-quality dual ball bearing fan gives the SuperNOVA 750 G2 an excellent thermal and acoustic profile, and its high reliability ensures a long PSU lifetime. 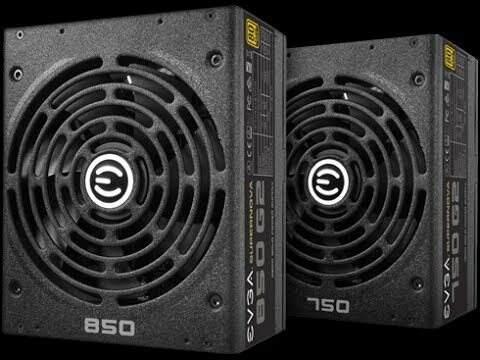 750W EVGA SuperNOVA 750 G2, Full Modular, 80 PLUS Gold, SLI/CrossFire, Single Rail, 62.4A, 140mm Fan, ATX PSU is rated 4.5 out of 5 by 4. Rated 5 out of 5 by gazza202 from does what it says Like the EVGA product it replaces it does what it says. No longer has the rear facing handle that might have irritated some (but not all). Turns off when fan not required. Some admire the all black cables - but I quite liked the previous red and distinguishing VGA card power cables. MB power cables did not replace in situ owing to different connector configuration - had to replace the MB main power cable and reroute to the MB. Rated 5 out of 5 by William7867 from Great for the price Great PSU for the price, the black sleeved cabling is a lot better than the multicoloured ones some other brands use. The Eco mode is also pretty good, been using that since day one. No issues at all after a few weeks of use. Rated 5 out of 5 by Abdul from Because it's worth it! Probably the most underappreciated part of any desktop build. Coming from rigs where the case would hum quite loudly, i really appreciate how suprisingly quiet this psu is even when there's no audible noise around me! Pros: QUIET 750w (OC CPU + SLI/CF setup) 60+ amp rating on the v12 rail ECO mode button (only uses watts you need) Attractive black sleeved cables. Well packed + plenty of cables to power your hardware. Modular cabling is awesome. + Gold rating (means more efficient power use) Cons: Size Price I had an issue with securely attaching this to my case. I was only able to screw it in on two sides of the psu due to the awkward positioning of the screw mounts in relation to the back of my case, though this was a minor issue and doesn't affect the functionality of the product at all. Rated 3 out of 5 by dragos77 from Quiet while on ECO.. Very quiet on ECO mode.Unfortunately mine has a rattling fan that is on the loud side so it went for RMA.